IRVINE, CA--(Marketwire - September 20, 2010) - Job Creation - How to grow employment in Southern California will be the focus of the CleanTech OC 2010 Conference & Expo on Monday, September 27th at 12:30 p.m. at the Hyatt Regency Hotel in Irvine. More than 300 top business, government and private investment leaders in clean technology will come together to focus on creating southland jobs in one of the fastest and hottest growing industries in California - Clean technology. Clean technology will lesson our dependence on foreign oil while sustaining our natural resources. "Green jobs are being created at a rate that far outpaces the rest of the economy, and private capital is pouring into the clean tech sector at levels exceeding all others," said Greg Trimarche, Partner, Bryan Cave LLP, Co-Chair CleanTech OC. "We are so excited people from throughout the industry will attend the conference." 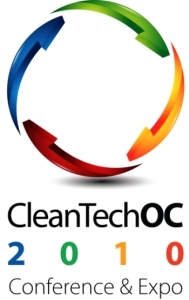 There are 275 clean tech companies in Orange County alone. Clean tech is the fastest growing segment of the Orange County economy. A few leading Orange County clean tech companies include Bluefire Renewables, Microsemi, Verengo Solar Plus and Quantum Sphere. Clean tech companies include alternative energy producers, alternative fuel vehicles, green building companies, non-polluting product manufacturers and the banks, venture capitalists and other firms that support them. Greg Trimarche and Sukhee Kang, Mayor of the City of Irvine will welcome the attendees and Steve Westly, former California State Controller and Managing Partner, the Westly Group will deliver the opening presentation. Plenary sessions of federal and state government incentives for clean technology will be followed by local clean technology case students presented by Santa Ana Mayor Miguel Pulido, a CleanTech OC co-chair, and Supervisor Bill Campbell. Dr. Scott Samuelson of the University of California at Irvine will provide the closing presentation. Additional conference speakers include Denise Tyrrell, Southern California Representative, California Public Utilities Commission, David Jones, Managing Partner, SAIL Venture Partners, OC, Brian Olson, CFO, Quantum Technologies, Greg Neichin, Vice President, Cleantech Group and Luke Hayes, Principal, Craton Equity Partners. Sponsors include: Brandman University, Bryan Cave LLP, Disneyland Resort, Gannett Fleming, KPMG, Microsemi, OC Waste & Recycling, ROTH Capital Partners, SAIL Venture Partners, Southern California Edison, Squar Milner, UPS, and US Bank. CleanTech OC is co-chaired by Miguel Pulido, the mayor of Santa Ana, and Gregory Trimarche, a partner at Bryan Cave LLP in Irvine. Pulido serves on the board of the South Coast Air Quality Management District and is chairman of the US Conference of Mayors energy committee. Trimarche leads Bryan Cave's Orange County litigation, government affairs, and environmental client service groups and is a leading voice for clean technology issues in California. Among other things, he has served as a Chair of the Environmental Law Section of the State Bar of California. The CleanTech OC Board of Directors include Pulido, Trimarche, Orange County Supervisor Bill Campbell, Anaheim Mayor Curt Pringle, Irvine Mayor Sukhee Kang, and Huntington Beach Mayor Cathy Green, as well as representatives from Bryan Cave LLP, KPMG, Southern California Edison, Sempra Energy, Brandman University, Environ Corporation, SAIL Venture Partners, Roth Capital Partners, Pegasus Capital Advisors, and Squar Milner. CleanTech OC offices are housed at Brandman University in Irvine, California the new affiliate of Chapman University. Mike Levin, an attorney with Bryan Cave LLP who specializes in clean technology, energy and environmental issues, as well as government affairs, serves as the organization's Executive Director. He was previously a vice president of a clean technology company in Northern California.